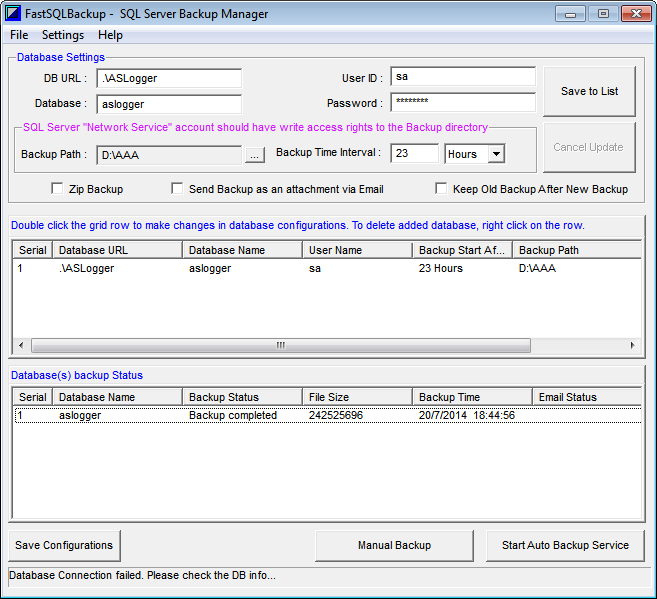 FastSQLBackup is an easy to use SQL Server database backup manager software. FastSQLBackup allows you to take backup of your business database(s) automatically on daily, weekly, monthly basis. It can take backup in zip format or normal backup. Database Backup Manager allows you to keep every backup on your backup device or delete old backup after taking new backup. FastSQLBackup has an option to email your database backup on your configured email account as an attachment. Backup Manager keeps last 3 backups on your backup device even if you select the option "Delete Old backup after new backup". There are many tools and accidents to drop database in chaos and lost time, money and business as result. Do not wait when will be late! Now you can sleep tranquilly. Ahmad software "FastSQLBackup Database Backup Manager" will automatically create and store your databases backups at your specified device. "FastSQLBackup Database Backup Manager" is really FastSQLBackup and able to backup big databases. Easy to use and customizable database backup management. Automatically manages database(s) backup at the specified interval of time. You can also take manual backup on need basis by just a single click. Backup is automatically zipped to save disk space. SMTP Email can be configured to get email with database backup file attachment. You can configure database backup on daily basis or delete old backup after new backup. Track Backup Manager Activities by logs. Add multiple databases on different servers to take backup automatically. Save configurations of configured databases in FastSQLBackup Database Backup Manager.